Two minor updates at the Android Market. Version 1.3.1 of Checkers for Android has a slightly improved search and evaluation in the checkers engine. Some users complain the engine plays too strong, others say it is too weak. Needless to say I enjoy the challenge of making a strong engine more. I also added an "undo" feature for this game. Version 1.3 of Chess for Android now also has the option to disable highlighting all valid moves once a piece has been selected for more experienced chess players. I also modified the on screen button layout. 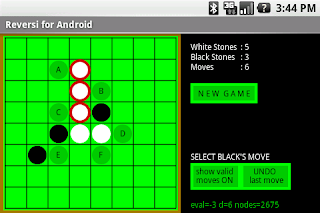 Version 1.3 of Reversi for Android at the Android Market adds an "undo" feature of the last move (to correct a mistake) and an option to disable the "ghost stones" for all valid moves (for users that prefer to see the board as in real-life). 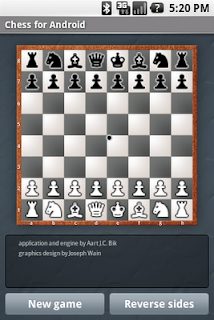 I posted version 1.2.2 of Chess for Android at the Android Market that fixes a bug that would sometimes allow castling when no longer legal. I validated the move generator of the chess engine by doing a perft (an internal feature) on several board positions to minimize the probability of other bugs related to move generation. 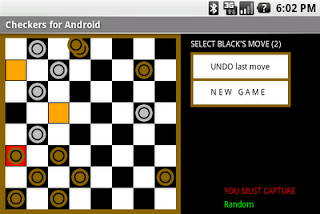 I just posted version 1.2.1 of Chess, Checkers, and Reversi for Android at the Android Market with trackball support. A small circle denotes the trackball cursor, as illustrated in the screen shot below. Hopefully this will make the input easier. Many thanks to Chris Bueno for quickly testing the applications shortly after posting! I received my own G1 (well, strictly speaking, the Android Dev Phone 1&#153)! This means now I can (1) read all user comments posted at the Android Market, and (2) experience my applications on the real device, rather than on the emulator. After just a few minutes I must agree with users stating that touch screen input is rather hard given the board size (something I could never experience on the emulator, where touch is emulated with mouse input). So, trackball support may be a good idea after all. I can now read the last few comments that are posted at the Android Market for each application. For chess and reversi, feedback is mostly constructive. I was very shocked, however, to read the comments posted for checkers. People freely post four-letter words and do not shy away from personal insults. Why? Because the application uses the official straight checkers rule where jumps are mandatory? Perhaps, but adding an option to make captures optional did not seem to help. Because graphics are not advanced? True, but I wrote the game for fun and give it away for free! Because the application plays too strong (or too weak)? I assumed people like a challenge (and, conversely, I still have ideas for improving the strength of the checkers engine).